Roger Federer salutes the crowd after beating Bjorn Phau in his second-round opener on clay in Portugal. (CNN) -- World No. 1 Roger Federer got his European clay season up and running at the second attempt with a routine win in his opening match at the Estoril Open in Portugal on Wednesday. The Swiss superstar was upset by young Latvian Ernests Gulbis in Rome last month, but had no such problems against German journeyman Bjorn Phau as he triumphed 6-3 6-4 in the third-tier ATP Tour event. The 28-year-old, returning to the tournament that he won on his debut there in 2008, will next play another seeded player in Friday's quarterfinals when he takes on French veteran Arnaud Clement. 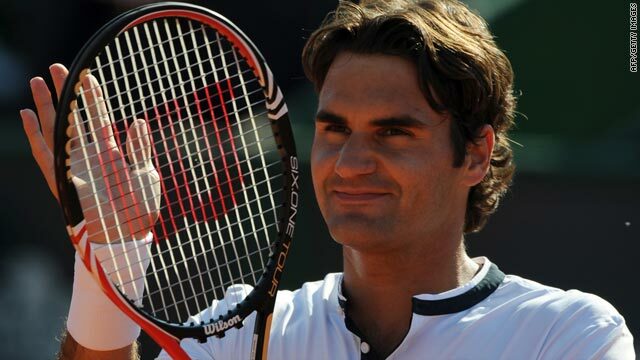 "I'm happy that I came through the first round, it was nice to win," Federer told reporters. "Today was a matter of coming through tough situations. I played well when I was down 0-40 and serving for the first set. "This win was not always beautiful but it doesn't matter. I'm sure my best tennis is not far away. I have a bit of a breather now and I'm looking forward to Friday." Federer has now been top of the world rankings for 281 weeks, and if he can stay there for another five he will match the all-time mark of American Pete Sampras. But he has been surpassed by Rafael Nadal on the list of all-time Masters Series titles after the Spaniard won in Rome to match record-holder Andre Agassi on 17. Nadal is poised to be Federer's biggest obstacle in his bid to retain his French Open title later this month, having ended an injury-wrecked past 12 months by winning his first two events of this season on clay. Federer's route to a second success in Estoril has been made easier by the withdrawal of Croatian second seed Ivan Ljubicic, who has pulled out due to the stomach strain that ended the world No. 14's campaign in Rome. Defending champion Albert Montanes moved into the last eight with a 6-1 6-2 victory against fellow Spaniard Daniel Gimeno-Traver. The fourth seed will next play Uruguayan eight seed Pablo Cuevas, who overcame Spanish qualifier Marcel Granollers 7-6 (10-8) 7-6 (7-2). Meanwhile, top seed Marin Cilic won his opening match at the BMW Open in Munich, moving into the second round as he completed a rain-delayed 6-4 6-2 victory over Michael Berrer on Wednesday. The Croatian will next play another German, Simon Greul, whose fourth-seeded compatriot Philipp Kohlschreiber also progressed into round two by beating Daniel Brands 6-4 6-4. Russian second seed Mikhail Youzhny defeated German Andreas Beck 6-3 6-3 to reach the third round, where he faces Jan Hajek of the Czech Republic. Third seed Tomas Berdych moved into the third round, with the Czech defeating Spain's Pere Riba 7-5 6-1.